Since time immemorial humans have complained that life is becoming more complex, but it is only now that we have a hope to analyze formally and verify this lament. This article analyzes the human social environment using the "complexity profile," a mathematical tool for characterizing the collective behavior of a system. The analysis is used to justify the qualitative observation that complexity of existence has increased and is increasing. 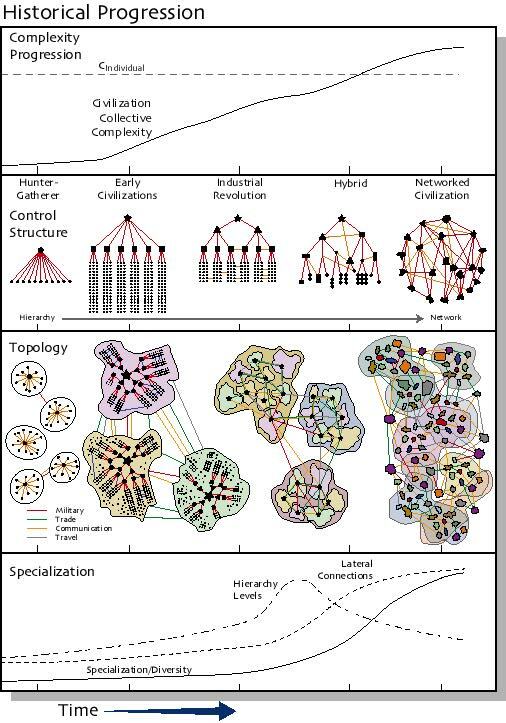 The increase in complexity is directly related to sweeping changes in the structure and dynamics of human civilization—the increasing interdependence of the global economic and social system and the instabilities of dictatorships, communism and corporate hierarchies. Our complex social environment is consistent with identifying global human civilization as an organism capable of complex behavior that protects its components (us) and which should be capable of responding effectively to complex environmental demands. How often have we been told by various philosophers and universalistic religions about unseen connections between human beings and the collective identity of humanity? Today, global connections are manifest in the economy, in transportation and communication systems, and in responses to political, social and environmental crises. Sometime during this century a transition to global conflict, and thence to global cooperation, took place. Along the way the conditions of life changed, driven by technological, medical, communication, education and governmental changes, which themselves involved global cooperation and collective actions. What is generally not recognized is that the relationship between collective global behavior and the internal structure of human civilization can be characterized through mathematical concepts that apply to all complex systems. An analysis based upon these mathematical concepts suggests that human civilization itself is an organism capable of behaviors that are of greater complexity than those of an individual human being. In order to understand the significance of this statement, one must recognize that collective behaviors are typically simpler than the behavior of components. Only when the components are connected in networks of specialized function can complex collective behaviors arise. The history of civilization can be characterized through the progressive (though non-monotonic) appearance of collective behaviors of larger groups of human beings of greater complexity. However, the transition to a collective behavior of complexity greater than an individual human being has become apparent from events occuring during the most recent decades.